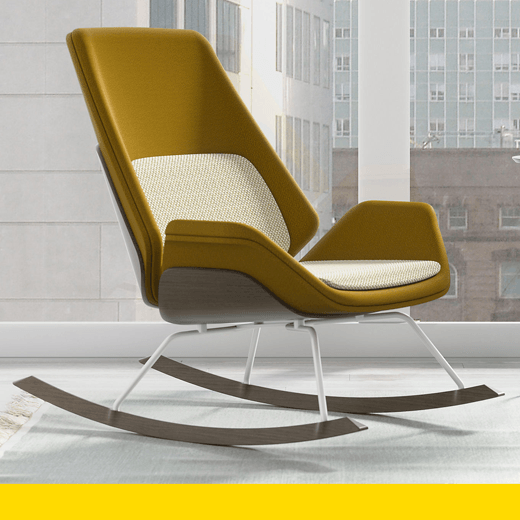 The Fulton Rocker is a refined modern interpretation of the classic rocking chair intended for both the residential market and the growing corporate segment focused on wellness and a more nurturing work environment. The classic rocking chair has a magical calming effect. The rocking motion releases endorphins, which can improve mood and reduce stress and pain. As more and more companies invest in wellness for their employees to help offset the over-programmed and distracting world we live in today, a rocking chair has a unique benefit for employees. The challenge was to create a rocking lounge that balances aesthetics, ergonomics and durability requirements for contract furniture. Aesthetically, the goal was to create a modern classic that mixes premium materials and allows for easy customer customization between the layers of shells, upholstery, cushions and hardware. There was also desire to create a refined aesthetic and proportion that elevates the design beyond the slab-like rockers currently produced in the market.